MAZE RUNNER: THE SCORCH TRIALS Review | Warped Factor - Words in the Key of Geek. There are spoilers for both the movie and the original novel throughout. This film had been out in the cinema for about a week when I finally got around to watching it, and when I did, man was I a fan. In my opinion, and this doesn't happen very often, the Maze Runner movies (so far) are up to par with the books. 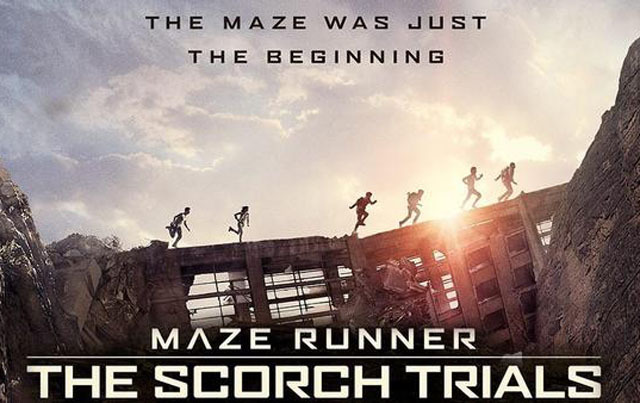 Maze Runner: The Scorch Trials is the second out of three movies based on the Maze Runner trilogy. (Side note; personally I am glad that the last film is not going to be split into two like every other series is doing in the world - Thanks, Twilight.) It begins straight after the last one has ended, Thomas and the gang being "rescued" by survivors outside of the Maze. Then after causing trouble they traverse through "The Scorch" - aka desolate cities covered in sand. There are a lot of things different to the book. I haven't read it for months but skimming areas of text I can tell they've had to take some creative differences in the film. SPOILER ALERT for the book here; in the novel Brenda and Jorge are both referred to as Cranks, but not in the film. In the movie adaptation the Cranks are the flare-infected people (Another side note; the movie Cranks reminded me of a mix between the Clickers from The Last of Us and just your normal everyday zombie - especially the fully turned ones). Another difference between the film and the book is Teresa. In the book, she tells Thomas to leave her and ends up with a gang of girls and takes Thomas back to WICKED. In the film, he takes her with them and she's all kinds of shady. Everything gets a little crazy in the novel, but I actually prefer the route the film has gone down. It simplifies a lot of the storyline, making it easier to understand yet still getting all the betrayal and pain as you do in the book. One thing I would have liked to have had in the film that wasn't - but will hopefully be included as a deleted scene - was a longer scene with Blondie (Alan Tudyk) in it. He really could have played the crazy part that little bit better if he'd had more screen time to do so. Another thing I have loved while watching The Scorch Trilas was the sarcastic remarks and deadpan looks that Minho, the movies sidekick character, makes. He's fantastic. I often found myself thinking the exact same things as he said, and not just because I've read the book. In fact Minho isn't even that sarcastic in the book, he has his moments but not nearly as much as he does in the film. All in all, The Scorch Trials was amazing. It had a few great jump-scares, fantastic CGI, and brilliant acting. The way they've managed to create these desecrated landscapes of what appears to be mainly New York City (judging by the bridge in the film, but might not be), a lot of effort has been put into this and it has paid off. Dylan O'Brien is still holding strong in his portrayal of Thomas, and if the third book and movie are as good as I hope they will be, I think I'm in for a marathon when they all come out on DVD. Until then roll on February 17th 2017, when Maze Runner: The Death Cure arrives in theaters.